Mandala Seeds has started making cannabis seeds in 2004 by Mike and Jasmin. To develop these seeds they have travelled all over the world and they made a selection of a number of very beautiful cannabis strains. Mandala Seeds delivers its strains only as feminized cannabis seeds, perhaps there will be autoflowering strains in the future. California Dream from Mandala Seeds is a cannabis strain that contains a nice mix of Indica and Sativa genetics. This weedplant is very suitable for a grow in a SCROG setup. This cannabis plant has a high resistance against fungi. Far Out from Mandala Seeds is a delicious Sativa cannabis strain that gives you a pleasant high feeling after smoking. This weed strain is originated by crossing very nice and well-known cannabis strains. These cannabis seeds ask for some experience of the grower. Fruitylicious from Mandala Seeds is a very tasteful cannabis strain with mainly Indica genetics. They are suitable for an indoor and an outdoor grow and they grow fine with less food. This cannabis plant is suitable for the grower with some experience. Hubble Bubble from Mandala Seeds is a very popular cannabis strain with mainly Indica genetics. This is a weedplant that gets the appearance of a Christmas tree and she gives you a pleasant balanced feeling. Suitable for indoor and outdoor grows. Purple Paro Valley from Mandala Seeds is a Sativa dominant cannabis strain that can handle the lower temperatures. She gives a pleasant feeling after smoking and has an appetizing effect. This strain is coming from the western of Bhutan. White Bhutanese from Mandala Seeds is a cannabis plant that has mainly Sativa genetics and the origin is very nice and special. This is a white weed strain with a powerful effect, this strain is also suitable as medicinal cannabis. White Magic from Mandala Seeds is a nice white cannabis strain that is coming from Congo. This weedplant is suitable for the growers without experience, because she is easy to grow. She will do it fine in an indoor and an outdoor grow and she has good medicinal characteristiscs. Het merk Mandala Seeds is een bedrijf dat zich vanaf 2004 bezig gehouden heeft met het ontwikkelen van wietzaadjes. Ze leveren hun feminised wietzaadjes in pakjes van 3 en 6 zaden. Ook is het mogelijk deze zaden bij ons los te kopen, we verpakken deze zaden dan handmatig in vochtvrije 'microfuge tubes' met duidelijke labels. De verpakking van Mandala Seeds kan verschillen wanneer je kiest voor een ander aantal of andere soort dan dat op de afbeelding staat. 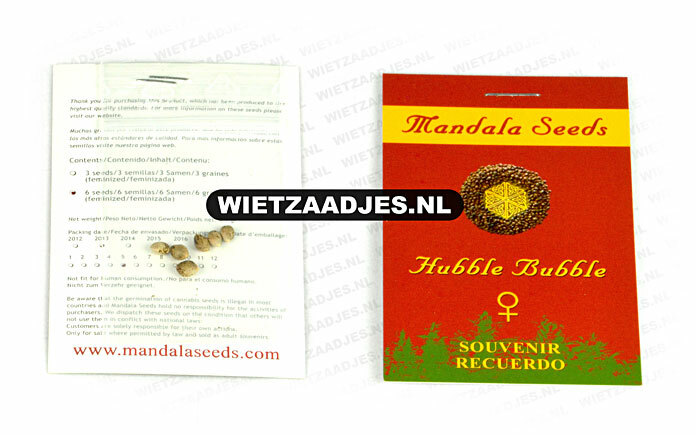 Mandala Seeds biedt de volgende feminised soorten: California Dream, Far Out, Fruitylicious, Hubble Bubble, Purple Paro Valley, White Bhutanese, White Magic.